Mr. David Iyofor, a media aide to the Minister of Transport and former Governor of Rivers state, Rotimi Amaechi has replied the former aide of Ex-President Goodluck Jonathan on electronic media, Reno Omokri saying “You are like a mad man in the market square that points his fingers at sane people, calling them mad.” Mr. Iyofor is replying a write-up by Reno titled “Time to question the pot bellied Amaechi’s sanity – Reno” wherein Reno said the minister of transport is a liar by accusing Jonathan of squandering money meant for Nigeria’s development. My dear Wendell aka Reno, I am not sure how to address you, whether to call you Reno Omokri or Wendell Smilin. This in itself is a fundamental problem. Your multiple identities send a profound message about your character and duplicitous personality. For the benefit of those who may not remember, I crave your indulgence to remind them that Wendell Smilin is one of your multiple names, the fake name(like the fake opinion articles, replete with fake news you write), you used to create a fake document that sought to portray our former Central Bank Governor, now Emir of Kano, Sanusi Lamido Sanusi as a sponsor of terrorism in 2014 when you worked as the lead social media attack dog for former President Goodluck Jonathan. Your role was simple: disparage and demonized anyone who attempts to disagree with, and criticize, most times constructively, your principal. I have no qualms with how you decide to put food on your table. However, I quiver whenever I recall that you used and faked the name of your brother-In- law’s innocent young son, Wendell Simlin to demonize Emir Sanusi. Who does that? What kind of a human being are you? You’re at liberty to sell your conscience, soul and even your entire being (both physical and spiritual), for a mess of porridge; but must you drag the name of your innocent young relative into your mess? 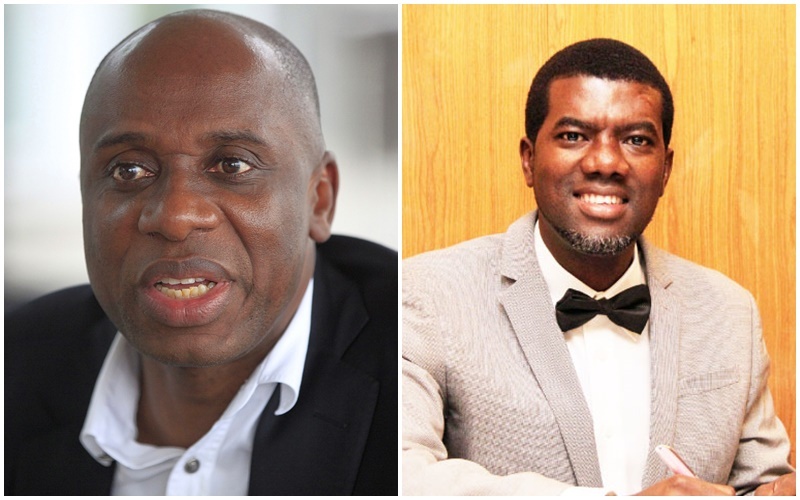 Before I dig into your niggling obfuscating article- Time to question the pot bellied Amaechi’s sanity- on Rotimi Amaechi, Nigeria’s Minister of Transportation (by the way, one of our finest administrators), again, indulge me to make a confession. I sometimes sympathize with you, especially during the early days after you and your principal were unceremoniously and shockingly (to you) voted out of Aso Rock Villa; no thanks to Rotimi Amaechi and other gallant democrats. I imagined your abysmal pain, your colossal loss, and the awful, dreadful end to your Aso Rock meal ticket; and tried to situate your profound angst, uncontrollable anger and intense hatred for Rotimi Amaechi because of the key role he played (which was noble) in dislodging your principal, which inadvertently took away your source of livelihood. Honestly, I tried to understand how you felt and that made it less difficult to ignore your early meaningless and nonsensical vituperations against Amaechi. But for how long will you stay angry and mad at Amaechi for playing a key role in the removal of your boss? As a pastor (that is one prefix in front of one of your names I can’t seem to wrap my head around), you ought to know that the Bible tells Christians not to hold a grudge or stay angry. In your case it’s been such a long time-almost two years after your principal lost the Presidential election. My dear Wendell Simlin aka Reno Omokri, your recent tirade, like the previous ones targeted at Rotimi Amaechi clearly signposts a dark vengeful heart. You called Amaechi a ‘confirmed liar’ and questioned his sanity; while the reality is that you are the one who had consistently lied and is still lying to Nigerians, faking documents and faking news to deceive Nigerians. Tell me where, when and how Amaechi lied? Did Amaechi lie when he said recently in the interview with some national newspapers that the then CBN(Central Bank of Nigeria) governor, the same Sanusi Lamido Sanusi that you faked documents to demonized, wrote a letter to your principal our then President, that $49 billion cannot be accounted for and so was missing from NNPC account and not paid to the federation account? Was it because Sanusi had the guts and courage to write the letter of the missing $49 billion to your principal that made you fake documents and social media accounts that designed to portray Sanusi Lamido Sanusi as a sponsor of terrorists? Was Amaechi lying when he said in the same interview that if the missing billions of dollars were deployed for developmental projects by your principal’s administration, the infrastructural gap we suffer today won’t be this huge and half of the missing money is enough to build the rail projects we are now going to borrow money from China for? Did Amaechi lie when he said your principal did not save money in spite of the huge savings he inherited from previous administrations and was surreptitiously spending alone the money meant for Federal, States and Local Government Councils? Was Amaechi lying when he said your principal’s administration refused to call NEC (National Economic Council) meetings for about two years, in violation of the constitution, so that the administration you were part of, can covertly continue to spend the money meant for the three tiers of government? Does it not trouble you that there seems to be an obvious link between the missing billions Sanusi Lamido Sanusi wrote about to your principal and the billons of naira and other currencies that were allegedly squandered on frivolities like the N2 billion supposedly given to marabouts to pray for your principal’s election victory or the N4 billion for propaganda work and many others? How do you even sleep at night? You say Amaechi lied and no money was missing; yet billions in Naira and other currencies are been recovered regularly from top operatives of your principal’s administration. You even went as low as writing that Amaechi consistently betrays his benefactors without mentioning one benefactor he betrayed; and the accusations from matters that are in court. How low can you go? While you questioned the sanity of Amaechi, many Nigerians feel pity for you and know that you are the one who needs psychiatric and perhaps spiritual help. You are like a mad man in the market square that points his fingers at sane people, calling them mad. The Amaechi I know will not apologize for the prominent role he played to remove your boss from the Villa. Your principal is gone and gone for good; perhaps, he may never return to Aso Rock as its landlord. No amount of demonizing Amaechi would reverse this. The earlier you get over the loss, the better for you, mentally and otherwise, Wendell Simlin aka Reno Omokri.